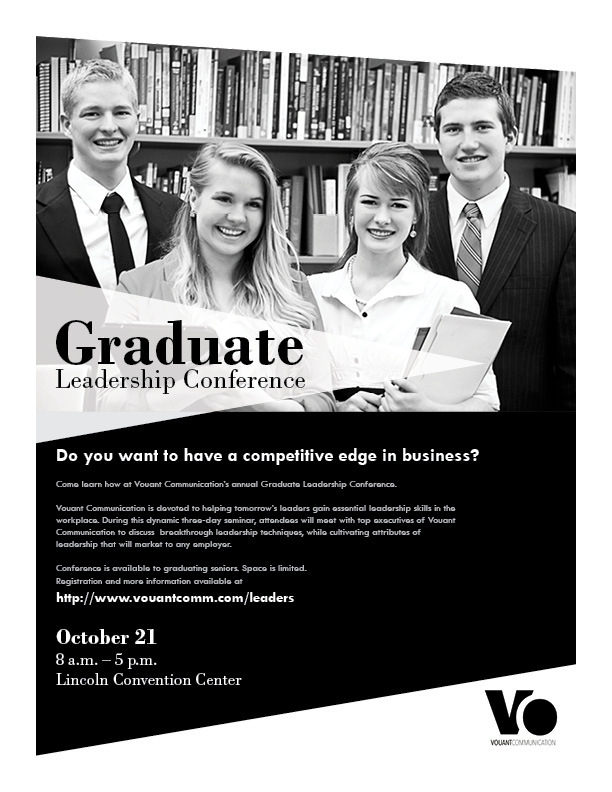 Description: A promotional flier for a graduate leadership conference, created in black and white. Process: I started with sketching out several different ideas using various layouts, images and logos. I then decided upon one, and began building in Adobe InDesign. The main elements were the image, logo, and various shapes. I worked with positioning the triangles and tried different sizes and opacities. These helped give a dynamic feel and create a sense of unity through repetition. I also decided on a smaller body copy that was left aligned and left a large amount of negative space. This helped create contrast and allowed for the type to breathe. The focal point was intentionally focused on the word ‘Graduate’. Message: I am speaking to graduates who want to have training and gather additional skills that will carry them further in the work place. Audience: Recently graduated students in a 21 to 30 year old range. Top Thing Learned: Gather as many critiques and feedbacks as possible. Wow, great flier. The image creates a great focal point. I love the black background with white text. It creates great contrast. It’s evident that you imagine your overall design as a collection of shapes, as the textbook instructs us to do. I like the interesting use of negative space. Very nice! I love the triangle theme you put through your design, how the angle of the triangle is perfectly aligned with the angle at the bottom of the flier. I love the black and white layout design. I love how you made the image take over the whole top half of the design. I also like how you made graduate very big so there was no question on who this conference was for. For someone that is about to graduate this would catch their eye and I would be very interested in what this conference was for.